O.K., I love most types of fishing! Shore and reef fishing doesn't cost much money, you don't need a reservation, and you can spend an hour or a day doing it. You can get up before the family, walk down to the beach in front of the hotel/condo, whip or dunk for an hour and be back in time for breakfast or the day's other activities. Then, in the late afternoon or after dinner, you can go again for an hour or so. It sure beats laying around the pool drinking $5 beers!!! Significant others don't seem to mind the short breaks either. *Whip, Whipping: casting and retrieving artificial lures/spoons/natural baits with ultra light to medium spinning gear. Sometimes referred to as "popping" by bass fishermen. Types of fish vary from the highly aggressive trevally, papio in Hawaiian, to types of snapper and goat fish. Yes, most of what you catch is very good eating. Basic rule of thumb is that if it's silver or red, it's good to eat. However, I do ask that you release all fish that you do not plan to eat or use for bait! *Dunk, Dunking: still fishing with bait, using either lead weights or bobbers. Gear can run from light to heavy, and can be either spinning or open face reels. Similar to fishing striped bass from the shore/beach. A very specialized Hawaiian form of dunking is called 'slide bait'. Slide bait is used to catch Giant Trevally, called Ulua in Hawaiian. Ulua can weigh nearly 200 lbs., but an average is more like 20-40 lbs. It should be noted that a local 'slide bait' fisherman caught a giant sea bass, weighing more than 560lbs, from a beach on Maui!!! I usually combine the two styles. I'll set up a larger spinner, 12-20lb. test, for dunking, but rather than just sit and wait for a bite (tho' that does have it's merits), I'll also bring along a light spinner, 6lb. test, and whip the area while I wait. This not only gives me something fun to do while I wait, it can also supply fresh bait for my dunking rig. I could write a book on 'how to....where to...', but some most excellent books all ready exist. It's a series (3) of books by Mr. Jim Rizzuto. "Fishing Hawaii Style" (Vol. 1-3) are the 'holy books' of Hawaiian fishing. Jim covers everything from A-Z: Rods, reels, line, hooks, weights, lures, bait, what to wear, where to fish, what to look for, types of fish and different rigging for them, even how to clean them! They're well written (they outta be, he's a teacher at a private academy), well illustrated and downright fun. Not only is "Fishing Hawaii Style" an absolute necessity for anyone hoping to shore fish here, I believe you will find some tips/tricks that you can apply to your fishing style back home as well. If you're planning to fish here, GET ONE OF THESE BOOKS!! !, read it on the plane over. If you can't find one in your local bookstore, order one from Amazon. So there you have it. 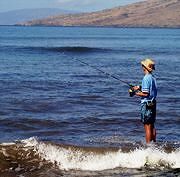 Shore and reef fishing are alive and well on Maui. If you plan to visit the island and want to relax with a little private rod 'n reel action, give me a shout.